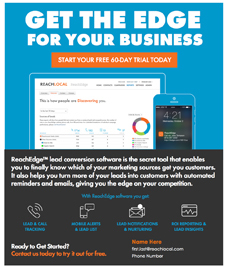 ReachEdge™ lead tracking and conversion software is the core of our total digital marketing system. It’s the secret tool that enables you to finally know which of your marketing sources get you customers. Then, it helps you turn more of your leads into customers with automated reminders and emails, giving you the edge on your competition. Try it free for 60 days and discover the difference it can make in turning more leads into customers.